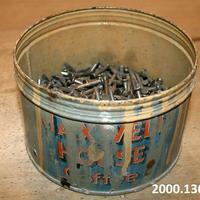 Can of nails in old Maxwell House coffee can. Can has a lot of paint on it. 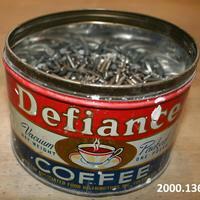 Defiance coffee can with many small nails in it. 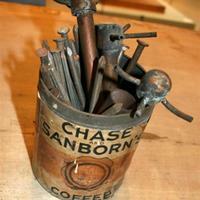 Approximately 35 large nails and miscellaneous metal items, probably copper fountain parts for pipes, in old Chase and Sanborn coffee can.